The pressure on US Bank to end its relationship with oil and gas pipeline companies has been mounting over the last five months. Late last year, dozens of groups sent the bank a letter, demanding an end to its financing of Energy Transfer Partners (ETP). Instead, US Bank doubled down and joined a massive new credit facility for ETP. In February, the Stop ETP Coalition and local Minnesota groups came together in US Bank’s hometown of Minneapolis during Super Bowl Week to make it clear we wouldn’t be ignored. Despite blizzard conditions, hundreds of pipeline activists protested at US Bank’s headquarters and in the streets for hours, calling for a world where banks no longer claim to work for sustainability while also financing oil and gas pipeline projects that are wrecking communities and the climate. The pressure increased through March, with actions in San Francisco and New York City highlighting widespread opposition to US Bank’s continued financing of pipeline companies. At Oil Change International, we dug into the numbers and released a report detailing how US bank has raised more than $2 billion for companies building oil and gas pipelines in the last year, since their “promise” to end financing for these pipelines. 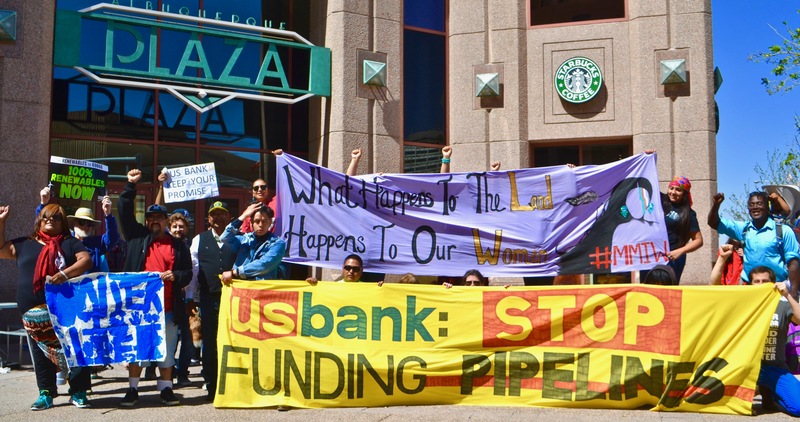 Still seeing little change at the bank, we took the fight directly to US Bank’s Annual Shareholder Meeting in Albuquerque, where representatives from pipeline resistance groups from across the nation told their stories directly to US Bank executives. Why all this campaigning targeting US Bank? Because they’re helping to fund one of the worst pipeline companies in the country: Energy Transfer Partners, the owner of the Dakota Access and Trans-Pecos Pipelines. Despite the national attention generated by Standing Rock during the Dakota Access fight, ETP is still finding money to build new pipeline projects around the country, including the Bayou Bridge, Mariner East 2, and Rover Pipelines. The company’s projects have been beset by repeated spills, work stoppages, fines, heavy security presence, and human rights violations, among other controversies. And a report released the day of the Annual Shareholder Meeting showed that ETP’s pipelines have spilled once every 11 days over the last 15 years, totaling over 6,000,000 gallons of discharged material. But these pipelines have been bravely resisted by Indigenous peoples, landowners, and water protectors, including L’eau Est La Vie Camp in Louisiana and Camp White Pine in Pennsylvania. And at the Annual Shareholder Meeting, these resistance leaders came to tell their stories. Outside the meeting, activists rallied at the Hyatt Regency Albuquerque, led by local Indigenous leaders and others from across the state fighting fracking in the Greater Chaco Region. Live from the @usbank Annual Shareholders Meeting in Albuquerque, we’ve got an awesome crowd out today. Speakers from New Mexico and around the country spoke of the importance of shared resistance and solidarity against pipelines, extraction, racism, and continued colonialism. Meanwhile, hotel security locked the nearby entrance doors to prevent anyone from entering the wing hosting US Bank’s Annual Meeting. Business press covering the US Bank meeting attended the rally as well, and wrote about it later that day. Inside the meeting, representatives from the Bayou Bridge, Dakota Access, Trans-Pecos, Mariner East 2, and Rover Pipelines spoke during US Bank’s Q&A session, conveying the effects of ETP’s pipeline construction on their lives and imploring US Bank executives to change course. Following the meeting, US Bank refused to comment to media, then posted a recording of the Annual Meeting excluding the Q&A section. During the meeting, we also delivered more than 38,000 petitions from activists around the world directly to US Bank’s CEO Andrew Cecere, calling on the bank to live up to his promise last year and to end all its investments in oil and gas pipeline companies, including ETP. Resistance to ETP isn’t going away. Neither is resistance to the banks and financiers raising money for companies building oil and gas pipelines that are a threat to sovereignty, water, air, land, and the climate. Indeed, this month’s protest in Albuquerque was one of several rallies and protests happening at bank meetings around the country. These banks – with US Bank leading the way in financing ETP – are on the wrong side of history, and they must end this financing immediately. i’m in a situation where i’m legally required to have an account with usb. i’d like to leave them as they are greedy and incompetent. I’m taking my money OUT of your bank if you keep funding pipelines!!!!!!!!!! Terry Ford says:, thanks so much for the post.Really thank you! Keep writing. Just like Trump, US Bank is being very stupid. Thankfully, I don’t have an account with that company. My hub and I have SERIOUSLY been discussing are options to remove ALL OUR FUNDS from Us bank. We are more interested in solutions that give higher returns for future generations!